To follow conventions of naming across GitLab, and to futher move away from the build term and toward job CI variables have been renamed for the 9.0 release. NOTE: Note: Group-level secret variables were added in GitLab 9.4. CAUTION: Important: Be aware that secret variables are not masked, and their values can be shown in the job logs if explicitly asked to do so. If your project is public or internal, you can set the pipelines private from your project's Pipelines settings. Follow the discussion in issue #13784 for masking the secret variables. GitLab CI allows you to define per-project or per-group secret variables that are set in the pipeline environment. The secret variables are stored out of the repository (not in .gitlab-ci.yml) and are securely passed to GitLab Runner making them available during a pipeline run. It's the recommended method to use for storing things like passwords, SSH keys and credentials. Project-level secret variables can be added by going to your project's Settings > CI/CD, then finding the section called Secret variables. Likewise, group-level secret variables can be added by going to your group's Settings > CI/CD, then finding the section called Secret variables. Any variables of subgroups will be inherited recursively. Secret variables could be protected. 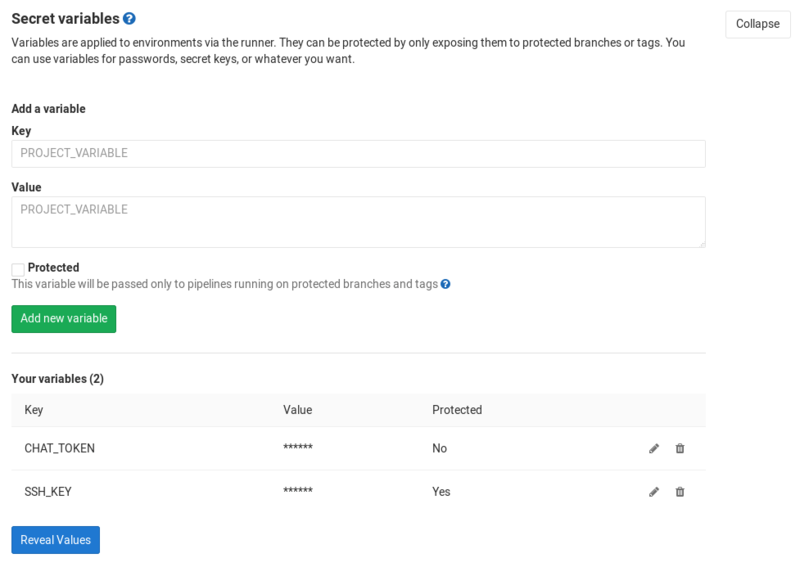 Whenever a secret variable is protected, it would only be securely passed to pipelines running on the protected branches or protected tags. The other pipelines would not get any protected variables. Protected variables can be added by going to your project's Settings > CI/CD, then finding the section called Secret variables, and check "Protected". WARNING: Enabling debug tracing can have severe security implications. The output will contain the content of all your secret variables and any other secrets! The output will be uploaded to the GitLab server and made visible in job traces! By default, GitLab Runner hides most of the details of what it is doing when processing a job. This behaviour keeps job traces short, and prevents secrets from being leaked into the trace unless your script writes them to the screen.